This B&H Kit includes the Tilta 4 x 5.65" Lightweight Matte Box from ikan and one Tiffen 0.6 ND filter. This kit provides you with a lightweight matte box with a rich feature set and a neutral density filter for exposure control. The matte box mounts to 19mm studio support rods, and features a swing away design that moves the matte box out of the way during lens changes, without having to remove the matte box from the support rods. The lightweight carbon fiber construction keeps the weight down, while still being strong enough to support a top flag (eyebrow) and side flags for lens flare control. The matte box also comes with 80, 90, 114, and 134mm lens adapters to prevent light leak from behind the lens. The included 0.6 ND filter provides an even reduction of light by two stops. This means that if you were shooting at an f5.6 without a filter; with the included ND filter, you would set your aperture to f2.8 to maintain the same exposure. A wider aperture setting results in less depth of field, which helps you achieve a more cinematic look. The filter can also be used during very bright days to bring down your exposure without adjusting your shutter speed or closing your aperture down so far that it degrades the image. The filter is designed with the ND material sandwiched between two layers of glass. This provides excellent consistency and unlike filters that mix the filter effect in the glass itself, you can have this filter polished to remove light scratches without affecting the density of the filter. This can save you the cost of replacing the filter. The Tilta 4 x 5.65" Carbon Fiber Matte Box easily mounts onto 19mm rails via its 19mm rod adapter. 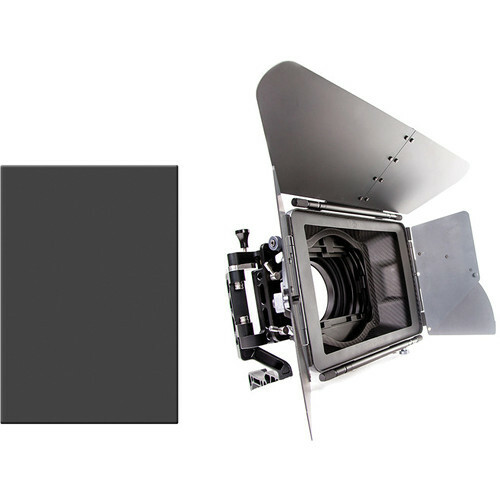 It features two 360° rotating aluminum filter holders of 4 x 5.65". The lightweight carbon fiber construction adds very little weight to your system, and the swing-away design allows you to make quick lens changes and simply move the matte box away from your lens when you’re not using it without having to detach it from your system. For use with 15mm rod systems, a 15mm rod adapter is included. The matte box also comes with 80, 90, 114, and 134mm lens adapters to fit most telephoto lenses, and three flags to reduce side flare. The Tiffen 4 x 5.65" ND 0.6 Filter is a solid neutral density filter providing a 2-stop exposure reduction. This 0.6 density creates a darkening of the entire image, allowing you to photograph with a wider aperture or slower shutter speed than normally required. By increasing your aperture or slowing your exposure time, you are able to control depth of field and convey movement more easily. Neutral density filters do not affect the coloration of the image and are ideal for pairing with other filters. This filter is made using ColorCore technology, a process that involves laminating the filter substrate between two pieces of optical glass and grinding flat to a tolerance of 1/10,000th of an inch. This filter measures 4 x 5.65" / 101.6 x 143.5mm. 0.6 solid ND filter darkens the image, allowing you to photograph with a longer shutter speed or wider aperture than normally required. Providing a 2-stop exposure reduction, this filter allows you to control depth of field and convey movement more easily. Box Dimensions (LxWxH) 15.8 x 13.9 x 12.1"